If you’re looking for the best espresso machine under $500, you’re probably a true coffee geek who’s not satisfied with just going out for a good shot or two of espresso. You probably know that good espresso doesn’t come from cheap machines but do you know all of the complex parts and machinery that go into the making of one? If you’re already confident of being able to pull a good shot, you could consider a manual machine where you control things like water pressure and temperature. But this is probably not the best option for a beginner, as every shot may be different from the previous one. The most popular home espresso machines are the semi-automatic, where you get to start and stop the pressure pump but the machine regulates it through the brewing process. Temperature controls are also automated with these. A fully automatic machine also auto-regulates the amount of water passing through the grounds. A super automatic includes components that automate the entire process from grinding to steaming. Here are the best selling espresso machines available on Amazon. The price of these machines go up the more automated the entire espresso making process is. To help you find the best espresso machine under 500 dollars, we are going to focus on semi and fully automatic ones here, as these are the most convenient for use at home without costing too much. If this is over your budget, you could consider some decent espresso makers that cost less than $300. It is important to note that no matter how good the espresso machine, if the coffee you use isn’t good, there’s nothing that can be done. If you’re going to spend the money on this, you must use freshly ground beans so you either have to have a good grinder too or by your ground coffee no less than weekly. Only use a conical burr grinder and one that can give you consistently fine grounds. Take a look here for our recommendations for a good coffee grinder. The USP of this espresso machine is that it’s designed to extract maximum flavor from your coffee grounds. While it comes with 15 bar pressure, the Breville Infuser BES840XL uses low and steady pressure first on the grounds to help them expand for even extraction. Next comes increased pressure where the hot water flows evenly through all the grounds, thereby extracting every bit of flavor from them. The construction of this Breville appliance includes a mix of stainless steel and high quality BPA-free plastic, so you know you are getting one of the best espresso makers in the market. It comes equipped with a thermocoil heating system that incorporates a stainless steel water coil. An auto purge function releases heat after it steams. As a result, the temperature of the water is first reached and then automatically maintained at an optimum level throughout extraction process. You can also have programmatic volumetric control over the 15 bar pump via a pressure gauge so you know that the extraction is ideal. The machine is filled with several user-friendly features, such as a cup warmer. It is located at the top of the machine and helps to keep your cup warm while brewing takes place. After brewing, you can use a feature that removes excess water from the filter basket so that the dryer grounds left behind are easier to clean up with the provided cleaning tool. Then there is the Empty Me indicator, which shows you that the drip tray needs to be removed and emptied. Another interesting feature is the automatic cleaning alert you get. For relatively inexperienced home baristas, there are dual wall filters, while more experienced ones can use the single wall ones. The swivelling steaming wand lets you easily enjoy cappuccinos and lattes too. After an hour, the machine goes to sleep and then completely shuts off after 3 hours. The cup clearance of the portafilter with commercial style spouts is high enough that you can directly fill a travel mug to go if you want. The machine comes with a built-in tamper that makes for a very dry puck after every pull. This is the best espresso machine with steam wand, as users say that it gives hot and consistent crema-rich shots everytime. If there’s one criticism, it would be that the water tank is slightly smaller than normal at 61oz instead of 67oz. You also have to descale regularly, as the thermocoil heating design is more susceptible to scale buildup. Priced for home use but with commercial quality performance, this is a semi-auto espresso machine where you start and stop the brew process yourself. There are three key aspects of the Gaggia Classic that make it the best espresso machine under $500 – brew pressure, temperature stability and water distribution. The Gaggia Classic machine has a 17.5 bar pump that auto-regulates to a lower ideal level and helps to extract maximum flavor and taste from the grounds that lie in a wide double or single shot brew basket. There is also a basket for coffee pods. The chrome plated brass portafilters are heavier and thicker, helping to hold the basket well in place. There is also a coffee tamper and 7 gram measuring scoop (ideal amount for this machine). While you can use the machine to make a single or double shot to deliver into two cups simultaneously, you can also use coffee pods for added convenience. The hot water dispenser can also be used to make tea and the frothing wand delivers a good crema or frothy milk for cappuccino. A cup warmer keeps your cup ready while the coffee is brewing. The waiting time is not too much, as the high voltage boiler reaches the brewing temperature quickly, while the portafilters and grouphead components keep it stabilized. A valve automatically releases pressure as soon a shot is pulled to release the remaining water through a chrome tube that runs into the drip tray so it can get ready for the next shot immediately. The coffee puck left behind is very dry, so it’s easy to empty out the basket. This espresso maker has a huge water reservoir. It comes equipped with a 72 oz. reservoir, which can be removed. Gaggia has given the machine an upgrade and the changes have a positive impact on your brew. The stainless steel case has become thinner which has helped to reduce the weight and cost of the machine. The steam nozzle now has a bigger steam knob and this makes it easier to turn the nozzle off and on. You also will notice it is quite a silent machine compared to the rest in the market. The other aspect that is really attractive is the ability to clean the machine quickly. A quick rub down with a damp cloth suffices and the basket and drip tray can easily be removed and cleaned. Back flushing is automatic. Users say that you can’t rush making shot after shot for your guests as the ready indicator light doesn’t truly tell you that the temperature and pressure is back to ideal levels for the next shot. However, the machine offers value for money and within no time you will enjoy returns on your investment. There are several similarities between the Breville Infuser BES840XL and this 800ESXL Triple-Priming Die Cast Machine, however, if the BES840XL is a bit over your budget but you like the main Breville features, the 800ESXL is a good alternative. Keep in mind though that this machine is heavy, weighing 26 lbs, whereas the BES840XL is much lighter and ideal for the home. One of the reasons for its extra weight is that it has a larger reservoir at 75 ozs. Its body is also made of a heavier metal sheet. This machine similarly uses thermoblock/thermocoil heating with a 15 bar pressure pump and the Purge function automatically adjusts water temperature after steaming to bring the water for brewing back to an ideal level. Instead of using low pressure initially to unfurl the grounds, this one releases 3 short and sharp bursts of water to first moisten them for ideal extraction. You also don’t have volumetric control for the shot but the steam wand with frothing works very well. The tamper tool is separate, so you have to manually press the grounds into the filter basket to get a dry puck after pulling a shot. This machine doesn’t have buttons to operate but instead uses dials for hot water, espresso brewing and steaming. You’ll have to use a different filter basket that you can buy separately if you want to use pods. This machine also does not have an auto shut off, so you will need to remember to switch it off when done. The portafilter and grouphead are not made of brass so the temperature drops a tiny bit, especially for a double shot. It also does not have a 3 way valve to release pressure quickly for the next shot, so making multiple cups can take a bit of time. However, considering the price of this machine, these are not deal breakers. If you want an espresso machine that takes up very little space on your kitchen counter, this Delonghi EC680 Dedica is a good option. The water tank is mounted at the back and is removable. It also uses thermoblock heating so the water temperature can be reached in just 40 seconds. It has a frothing system for your cappuccino and crema, although this is the one inconsistent performance that many users make note of. An automatic flow stop eliminates a mess and an auto standby mode turns on if you forget to turn the machine off. This machine is self-priming, so you can make a shot of espresso as soon as you want it. The filter is a 3-in-1 and allows for a single or double shot or a coffee pod. A tamper is included, so you can make sure that water flow through the grounds is ideal. There is a cup warmer on top for keeping your shot hot as long as possible. All espresso machines need to be descaled but this one alerts you when it’s time to do so. 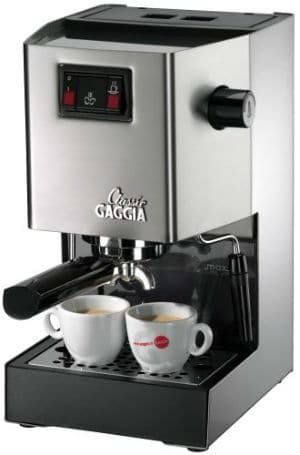 The Breville 800ESXL and Gaggia 14101 Classic Espresso Machines are amongst the best espresso machines under 500 dollars. If your budget is under 500 dollars you don’t want to stretch it to $1000, you can go ahead and gift your colleagues and friends one of these great coffee makers for present or buy one for yourself.